It amazes me how much we tend to underestimate the role white supremacist propaganda plays in creating, justifying and maintaining our oppression. Certainly this phenomenon impacts several groups of people, but my focus in this article is on Black people. What purposes do white supremacy and racism serve? All you need do is view Marlon Riggs’ pioneering documentary “Ethnic Notions” to appreciate white America’s long and systemic effort to thoroughly degrade and denigrate the Black image and psyche. But why so much effort toward this sinister goal? At its core, white supremacy postulates the lie that whites are innately superior to and therefore naturally poised to dominate and oppress people of color. The theory of racism falsely justifies this lie by assigning value and ranking to people based on their presumed racial category. Naturally, “white” people and those resembling them are assumed to be superior in almost every form of human expression and activity including but not limited to: beauty, intelligence, ability, leadership, potential, hygiene, health, judgment, ethics, etc. However, people of color are not the sole victims of racism. Racism encourages white people to feel secure in their whiteness although many of them are as destitute, ignorant and powerless as some of their Black counterparts! This false racial consciousness then prohibits such whites from developing a class consciousness that would lead them to organize with people of color around their common labor exploitation and jointly confront their mutual oppressors…the privileged and elite corporate interests which subjugate poor white AND Black people. So we see how racism works to divide natural allies, justify brutality and discrimination, and insulate the greedy elite from any real fear of interracial rebellion or revolution. 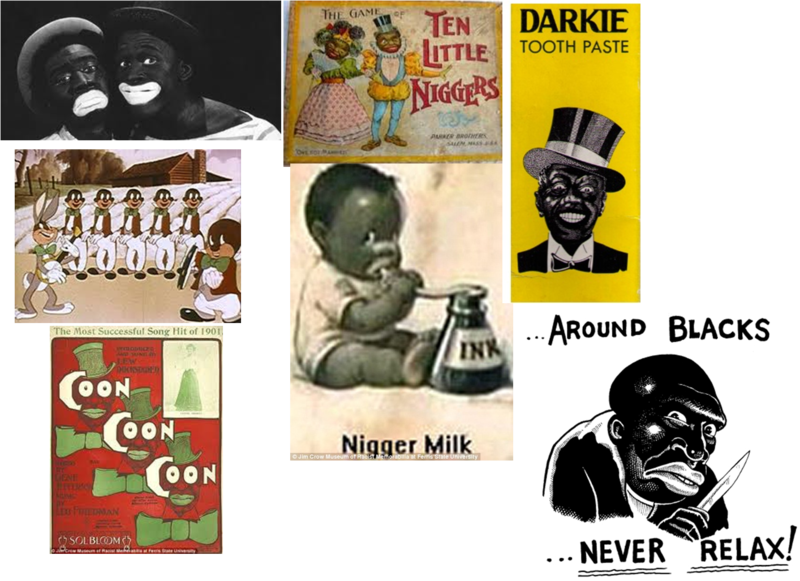 Why and how is propaganda used against Black people? Left to their own devices, humans act in their own best interests. No one desires subjugation! Therefore the only ways whites could get exploit our labor, and generally oppress us was to 1) use coercion/force and 2) convince us to become parties of our own victimization through brainwashing and social conditioning. If you can control a man’s thinking you do not have to worry about his action. When you determine what a man shall think you do not have to concern yourself about what he will do. If you make a man feel that he is inferior, you do not have to compel him to accept an inferior status, for he will seek it himself. If you make a man think that he is justly an outcast, you do not have to order him to the back door. He will go without being told; and if there is no back door, his very nature will demand one and cut one to enter. And the list sadly continues. Perhaps no one did a more thorough job of explaining and critiquing the dynamic of ranti-Black propaganda than did brother Malcolm, yet several decades after his murder, and the capable contributions of people like Amos Wilson, Naim Akbar and many others, insecurity, identity issues and self-hatred continue to debilitate our organizations, institutions and communities. First, we must come to understand how we were/are brainwashed. Second, we can learn the truth about ourselves and our history/contributions. However, it is not enough to simply produce lists of “Black firsts,” or “Did you know” Black history. Our history must also be analytical. We do ourselves a great disservice when we cite the past without applying thorough analysis. Third, we can teach our children to distinguish between propaganda about us and the truth. Fourth we should begin to identify, expose and challenge attempts to mischaracterize our people and smear our names. The struggle continues! 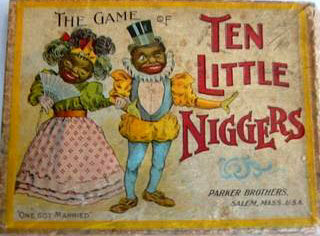 Blacks have long ago identified those elements of white racism that are used against us as a people. We continue to identify and talk about them while, at the same time, do nothing! Scholars and black pundits alike are well versed in what happened to blacks and what is happening to blacks. No need for a psychic in this scenario. The “what’s” have it. What’s consistently absent is a unified response to same. Whatever happened to the action part of the equation? Hispanics and Asians, as well as other groups, have it. They’ve exercised it. Most recently Hispanics threw down the gauntlet demanding Capitol Hill respond to the Immigration crises with optimum (not to mention quick) response. What are blacks demanding? Whining , moaning, groaning and pleading for attention is impotence on a grand scale. I definitely understand your position on this issue as it’s similar to mine. You’d be surprised at how many of us DON’T know these basic truths. You and I are well-versed, but I’m trying to reach those that aren’t…those that don’t understand how we’ve been conditioned so thoroughly. I address this by making sure my own children have an accurate knowledge of their people and our history, then I teach other youth and challenge the propaganda when and where I can. I’d love to see an organization similar to the ADL that challenges anti-Black speech, and other forms of propaganda everyday. Thanks for taking time to read. I appreciate your commentary! Wouldn’t it be interesting if all, or the majority of this propaganda was created by Jews, to keep us divided and under their control? Have we done the research? Who exactly created these games and cartoons? Name them. Are they “white” or are they Jews? Who precisely are these “white elite”? Name them. Are they “white”, or are they jews? We have to be precise and unbiased as we uncover this information. We have to dig deep and get to the sources. Propaganda has been a dangerous tool for a long time. Let’s be sure we are not actually helping the propagandists. The unknowing need to know and understand this. Keep on knocking them in the head with this. At some point, it will click. Persistence overrides resistance! They have no choice to conform! You’re uncovering the wool from the eyes of the blind. Thank you! I appreciate your appreciation. There was so much more I wanted to share on this topic, but I was concerned about brevity. Yeah I hear you. But I think it was very well said. You did a good job. How many times have you heard the sentiment echoed from a Black person saying that “we (Black people) are our own worst enemy?” If you have lived among Black people for any length of time, I am sure you have heard this remark made many times. The commonly shared sentiment held by many Black people that we are now our own worst enemy is not a strange phenomenon; it is in fact a deliberate designed outcome of a massive media driven psychological warfare system. The negative, inaccurate portrayals of Black populations that are so prevalent in the white controlled media are deliberately designed psychological warfare (perception management) programs. Presently Black people are now targets of a massive perception management program used for maintaining white dominance and control. This media driven system is being constantly employed to socially engineer mass feelings of self-hatred and division among African Americans that weakens our ranks and heighten mass insensitivity throughout the nation and world regarding our plight. Psychological Warfare is a common practice used by the United States government. According to the U.S. Department of Defense’s (DOD) developed doctrine of Psychological warfare it states that in order to maintain dominance and control over a targeted group and or population that their aggressions must be turned inward against themselves. And to meet this accomplishment the targeted group must be made to believe that their problems are themselves. We cannot ignore the fact the U.S. national media’s immense campaigns of deplorably negative portrayal of its Black population– that causes feelings of self-loathing, internalized turmoil and disunity among their group— is totally consistent with those applied perception management programs and systems developed by the federal government. This white governmentally controlled media’s deplorable depictions of its Black population meets precisely the objective of engendering Black self-hatred, self-doubt, and division among its Black populations thus defending its white dominance and control. The similarity is too great to be purely coincidental. The evidence is insurmountable. It is also too great for us not to connect the dots — it is in fact an exact match. Some studies have shown that these portrayals now reflects increasingly disparaging characterizations and prejudiced perceptions about African Americans that are arguably stronger today than they were after emancipation. The effects of this massive psychosocial program are also manifested in ideas, education, governmental policies, economic stratification, social segregation, housing markets, hiring and promotion practices, psychological issues, and minority access to a variety of social services and opportunity. It also affects attitudes that, when enacted through governmental policies, laws, and other legislation actions, serve to ensure that African Americans will not advance. This scenario is also consistent with those applied perception management programs developed for the U.S. government by propaganda/mass manipulation expert Dr. Edward Bernays. Dr. Bernays was hired by the U.S. Government and has worked directly under several U.S. Presidents. It was he that first formulated the methods of using propaganda to turn a harmless group into a fearsome enemy through lies and manufactured news items then using the false created image to justify mistreating and attacking the group. For this reason alone it’s more than reasonable to take a closer look at these ongoing negative statistics and find out what is really going on. Is it not plausible to conceive that these negative reports are in fact part of a massive perception management program deliberately designed to ensure the continuance of white dominance? Furthermore, the routine subjugation of African Americans could not occur so effortlessly without it being a deliberate perception management program. We can no longer ignore the obvious indications that the U.S. government is using its proven method of mass psychological manipulation against us African American. It is too prevalent to be merely dismissed as an oversight or as being the work of a few local governments. It is being instituted at the national level. Given the insurmountable daily evidence clearly it is easy to see that Black people are now presently targets of an applied Black debasing perception management program. We can no longer ignore the obvious indications that the U.S. government is using its proven method of mass psychological manipulation against African Americans. The preponderance of evidence makes this conclusion inevitable. Again the evidence is too great for us not to connect the dots. What is more, this contention that the U.S government is using a mass psychological manipulation program to influence and control its Black population is totally consistent with White America’s past tradition of resistant against Black advancement. History overwhelmingly demonstrates that the White elite’s innate proclivity for racism, control, and dominance is much too deeply engrained for them to merely just give up their practices of implementing different forms of suppressive systems against its Black population. Therefore this method of defending their position of white dominance was the logical choice, for unlike the extremely blatant systems used in the past, which Blacks were able to easily identify and therefore unify to form counter strategies against, this racist system is much harder to detect. This more covert method was the next logical choice because this method covertly provides the U.S. government a stealthier, socially acceptable means to both control and influence the national climate and engender personal psychological feelings among its　Black population that meet its objectives of maintaining its white dominance. Through this perception management program African Americans are being denigrated within every aspect of American society through reports about their educational failures, crime statistics, and national health statistics. In fact based upon the U.S. Government’s national health statistics and reports concerning the health of Black America, it appears as if the bodies of Black people are literally genetically and physically inferior to the bodies of Whites. However, when examined outside of governmental discretion and control, we see, to the contrary, that Blacks are often America’s greatest athletes. In other words, it is only when statistics are totally in the hands of the White government that the bodies of Blacks appear physically inferior to Whites. Clearly African Americans are now targets of a massive perception management program. WHY TARGET PARTICULARLY BLACK PEOPLE? Although the United States Government portrays itself as the leading ethical and moral authority of the world and professes equal rights for all American citizens, its oldest and most important objective has always been an unyielding commitment towards the preservation of its White dominance. Because there exists within the U.S. government a secret component. This secret component equates to being a secret government concealed within an existing public government. While although the face of the public government is one which portrays itself as the leading ethical and moral authority of the world and professes equality for all of its citizens, the secret government’s most unyielding objective has always been its commitment towards the preservation of its White dominance. This objective has always directly correlated with the development of many classified programs designed to protect its white statuesque against its minority population. No group has been a greater threat against this objective than its Black population. While all ethnic groups possess the ability to bring about real change within the United States, only its Black population has produced such change. During the 1960s African Americans confronted white racism on every front through militant means, nonviolent civil disobedience strategies, and by way of legal arguments within America’s highest Supreme Courts. African Americans also demonstrated immense unity. The unified strategies implemented by African American during the 1960’s civil rights movement against America’s white racist systems was unprecedented and remains unrivaled by any other minority group. These strategies resulted in the enactment of many civil right laws that improved the lives of all minorities. Therefore no other minority group has proven themselves as being a greater threat to America’s white dominance than that of its Black population. This fact alone necessitated that a perception management program be implemented targeting America’s Black population. The ultimate goal of this perception management program is to defend its white dominance by destroying the Black unity and cohesion that was historically the cornerstone of civil rights gains and that was a crucial factor of the survival of African Americans through more than four hundred years of white racial oppression. If the U.S. government did not implement a perception management program against its Black population that assisted it in maintaining its white dominance, it would then be diametrically in opposition to itself. Logic dictated that given that unity and cohesion among African Americans was responsible for the demise of White America’s past system of blatant, institutionalized racism, then destroying this unity would be an essential objective of this psychological manipulation program. The objective of the secret inner government has always been to maintain its White dominance over its Black population, and clearly, the method of psychological warfare meets this need. In fact this current mass manipulation scheme is the most effective racist system ever used against Black America because it covertly creates a national climate that allows the government to consensually suppress the advancement of its African American population thus maintaining its White dominance–but doing so with the added benefit of not appearing racist. We are not our own worst enemy – even though some African people in this country behave in manners that are not in our best interest. (This happens among all racial groups) The greatest enemy and problem we collectively face is still white supremacy and racism. What we must continue to do is to understand how today’s racist media driven perception management program are now used for maintaining white supremacy, what it is, & how it works. Once you’ve learn and come to fully understand how this system of racism works then teach this knowledge to others. Because our liberation from despair is greatly defendant on more of us becoming aware of this massive perception management psychological warfare that is being used against we Black people as a means of maintaining white dominance and control. Please make a commitment to share this article with at least 100 people. The end result of having doing so will exceed our long efforts. Please share, share, copy and paste and share again. Learn more about this Black Perception management program designed to control Black people at http://www.divineblacktruth.org. Wow F. Jones, your response was a blog article itself! The info you shared is right and exact, and I do appreciate the time you took to share it. I also encourage people to follow the link you provided. Thanks again! Don’t negate your efforts. Love the blog but truthfully, the ones who ‘don’t know’ are not reading your blog. They are watching Empire and Love & Hip Hop & The Housewives of Atlanta. Like us all, I was brainwashed for a long time but now realize that ALL that is said about black people is really just whites projecting. lol..ALL OF IT. I cannot say with certainty who reads or doesn’t read my blog. I am glad that you do, and I appreciate it. Thanks for your support! You are not entirely correct. Let’s get down to it. It’s our government who is treating all of us like slaves. Racisim is Governmental Propaganda that subjugates all of us. None of us will be truly free. Are you awake yet? Thanks for reading my essay (assuming of course, that you did). Assuming that what you wrote is valid ( I agree with all but the part about us “Never being free” or that only the government participated in anti-Black propaganda), what specifically about the essay is “not entirely correct?” the essay was specifically about anti-Black propaganda, not propaganda against everyone..
Amazing information. I will follow up and read those book and view the films listen. My brother I commend you on a job well done. Thanks for opening my eyes with this knowledge. I appreciate your appreciation, Tiesha! I am happy to know you plan on doing more research on the topic as well….